With the advent of more and more genealogical data making its way to various locations on the internet, it is not uncommon for family historians and fledgling genealogists to become frustrated and confused when searching for specific bits of family history information on the internet. This was supposed to be the Age of the Information Superhighway. Instead, even as so many records are coming on-line, doors are being slammed shut on so many more—often records that aren’t and won’t be online, now and perhaps ever. On Monday, January 8, 2018, the Wabash Valley Genealogy Society will be presenting a program entitled “Roadblocks, Red Lights and Detours” presented by Judy G. Russell, also known as The Legal Genealogist. The program will be held in the lower level conference rooms (A, B & C) of the Vigo County Public Library in Terre Haute, IN. Doors open at 6:00 pm for refreshments and socializing with the formal program running from 6:30 to 8:30 pm. 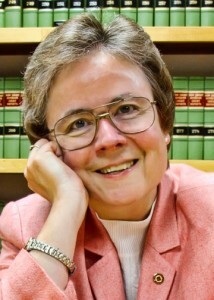 Judy G. Russell, is a genealogist with a law degree who writes and lectures on topics ranging from using court records in family history to understanding DNA testing. Judy is a lecturer, educator and writer who provides expert guidance through the murky territory where genealogy, history and law come together. Judy is on the faculty of numerous genealogy institutes. She is a member of the Board of Trustees of the Board for Certification of Genealogists from which she holds credentials as a Certified Genealogist and Certified Genealogical Lecturer. Her website is: www.legalgenealogist.com. Ms. Russell is a well-known international genealogy specialist who has written numerous articles and books while making presentations world-wide on a variety of topics. She is an engaging and entertainer presenter. Her “Roadblocks, Red Lights and Detours” promises to be an interesting and informative topic.